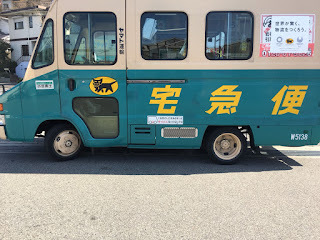 Here we have a very common van you will see in Japan it belongs to ヤマト運輸　やまとうん・ゆ　(Yamato unyu) which is a large courier company in Japan. I like their logo which is a black cat carrying a kitten. For Beginners Manga 1 please click here; Yotsubato! 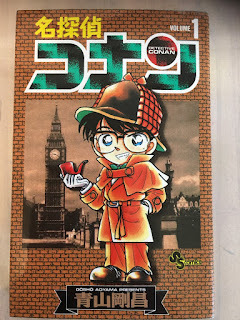 Here is Conan or Meitantei Conan, one of the most famous anime and manga in Japan. Every Japanese person knows this comic and it is extremely popular with elementary age children. Apparently overseas it is called Case Closed due to copyright issues. The story is about a Junior High School boy Shinichi who is a detective, one day he comes across a mafia like organization and they try to kill him by giving him a poison. However the poison does not kill him but shrinks him so he appears to be an elementary age child. He then lives undercover posing as a child and solves lots of crimes. The stories are quite good and like Yotsubato! each story can largely be read independently. The difficulty level is quite a lot harder than Yotsubato! but again it is all daily Japanese, plus a lot of crime vocabulary. 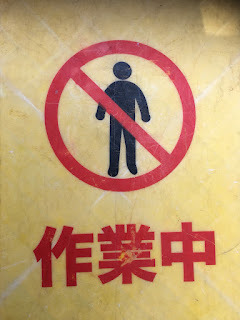 Okay, so here we have a person crossed out for no entry and three kanji underneath. 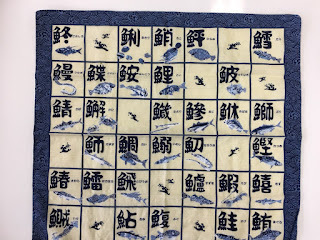 All three of these kanji are really useful and all are in heaps of other compounds. This is kind of like an under construction sign, in this case it was gardeners up ladders doing pruning. 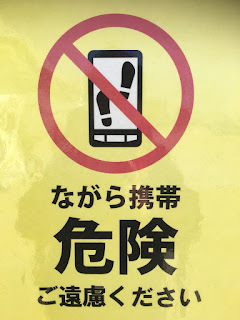 Meaning; Danger Please do not (walk) whilst using a cell phone. 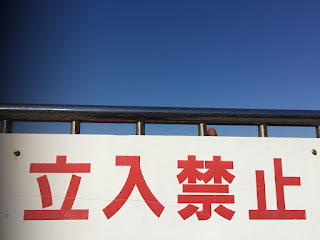 So 携帯　means portable or mobile and to mean cell phone technically you have to say 携帯電話　けいたいでんわ　(keitaidenwa), but it is commonly used by itself to mean cell phone. You will often see little booths displaying this character in front of supermarkets or shopping malls. 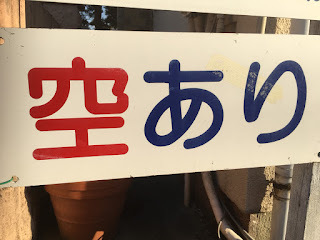 For years I have been sitting on Japanese toilets and sitting in Japanese baths looking at signs I could almost but not quite read (OK most of the time I didn`t have a clue!). So I made this site... I am happy to present our first toilet sign! 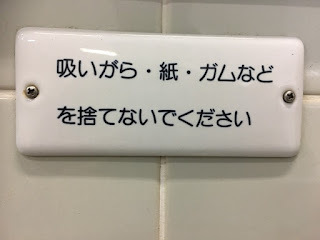 I believe it`s from a urinal, it`s not a particularly common sign but the kanji and vocab are. Meaning; Please do not throw away cigarette butts, paper, gum etc. Very common sign seen on doors and property. 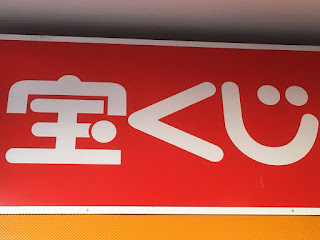 Again one of the most common signs you will ever see in Japan. Manga is an excellent way to study Japanese and learn kanji and vocabulary, there are manga for almost any interest you may have, however many manga are very difficult in the beginning if they don`t have furigana (Hiragana reading above the kanji). On this blog I hope to review some manga that I have read that are suitable for beginner to intermediate students. 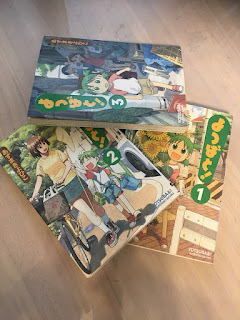 Yotsubato! is definitely my first recommendation for starting to read manga. 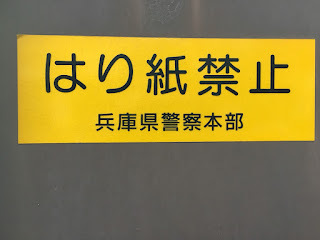 There isn`t a lot of text on each page and most of it is hiragana but there are enough kanji in there to learn new characters and to stop it becoming confusing as to where one word ends and the next begins (I find hiragana only books or manga like Doraemon a nightmare to read). Each book holds about 7-10 chapters and they usually read like separate stories so you won`t get bogged down if you don`t understand something. There are only 13 books in total, so it isn`t a huge series. 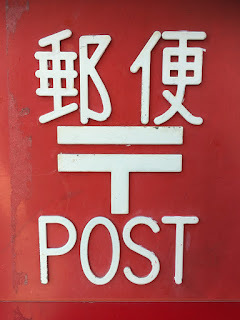 This picture is from a standard post box in Japan. They look a little like the British ones so its possible their design was copied from the English during the Meiji period when Japan brought in many ideas and systems from overseas. (But that`s just a guess so please correct me in the comments if I am wrong!). Some of you will recognize this character straight away! 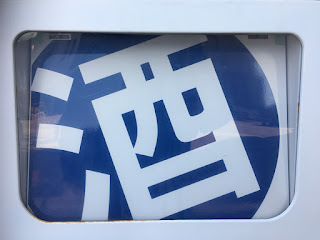 Another very common kanji you will see especially on the signs for convenience stores. 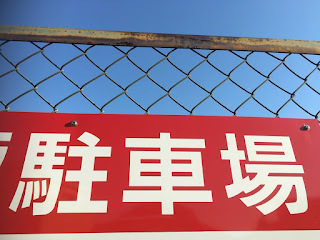 The radical on the left is water (さんすい）and the radical on the right is a bottle (or a bird) (ひよみのとり).